Formed as a small lumbering community along the Plank Road just outside the limits of Saginaw, Michigan in the 1860s, “Hemlock” in Richland Township has maintained pride in its lumbering heritage ever since. In the late 1970s, playing up this past, the local hardware store exhibited chainsaw carvers outside the store to draw in customers. From here, Sawdust Days was born. 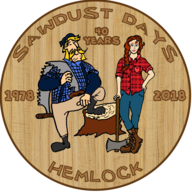 Stretching into a multi-day festival through the years, Sawdust Days now showcases craft and food vendors, entertainment, events, and family activities for all ages.